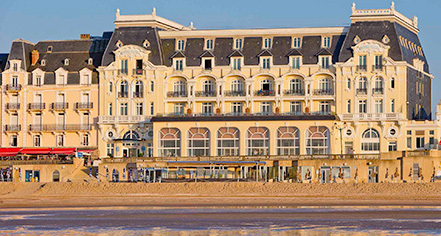 Straddling the majestic Norman coastline is Le Grand Hôtel Cabourg - MGallery by Sofitel, a luxury hotel that has been entertaining guests for more than a century. First built during the 1860s, ambitious hoteliers reconstructed the Grand Hôtel in 1907 to serve the town’s flourishing tourist population. Word of the luxurious building spread quickly, attracting many creative people to the hotel. The most famous among them was the world-renowned French author, Marcel Proust. From the time the building reopened until the eve of World War I, Proust was a regular guest. The hotel left a clear impact upon his life. It served as the basis for a fictional seaside resort named the Balbec that appeared in his celebrated, voluminous novel, In Search of Lost Time. Due to the profound influence it left on the author, the French Ministry of Culture registered the Grand Hôtel as a historic monument in 2014. The Grand Hôtel is now part of the Sofitel family of luxury hotels, having joined the company’s esteemed MGallery collection in recent years. Le Grand Hôtel Cabourg - MGallery by Sofitel offers 71 unique guestrooms and suites that provide visitors with modern comfort and outstanding views. Recently refurbished, every room features a luxurious king-size bed, a high-definition television, and a marvelous bath. Guests can also reserve one of the hotel’s three lavish suites or reenact the life of Marcel Prost by staying in the historically renovated Room 414. Considered one of the finest dining establishments in all of Normandy, Le Balbec at the Grand Hôtel never fails to impress its patrons. La Balbec offers exquisite French cuisine, crafted by its brilliant Head Chef, Jérôme Lebeau. Guests can also sojourn to La Belle Époque for sophisticated cocktails or catch a quick bite to eat at La Plage on the hotel’s private beach. The expert staff at the hotel’s spa can provide a series of comforting physical treatments that are certain to enliven any guest’s spirit. With over 383 square meters of meeting space available, the Grand Hôtel features comfortable accommodations that facilitate a convivial atmosphere. Cabourg is a popular seaside destination, with thousands of people traveling to the town’s shoreline every year. And the Grand Hôtel can help its guests enjoy a memorable day out at one of Cabourg’s splendid beaches. Guests can rent accessories directly from the hotel, as well as relax along its serene private beach. Local businesses offer a variety of outdoor activities to try, including parasailing, wind-surfing, and canoeing; additional attractions include mini-golf and go-karting. But the town itself possesses many more exciting attractions. Next to the Grand Hôtel is the magnificent Casino de Cabourg, a well-established music venue that has hosted the likes of Edith Pilaf and Charles Aznavour. The Hippodrome de Cabourg is also near the hotel, staging electrifying horse races year-round. Guests can also venture out into the surrounding Pays d’Ague valley to visit the many pastoral medieval villages that dot its landscape. From here, guests can travel to the numerous cultural landmarks scattered throughout the region, such as Dives-sur-Mer, the ancient city of Caen, and the D-Day invasion sites. Only two hours away from Paris, the Grand Hôtel is a wonderful place to start an unforgettable trip. 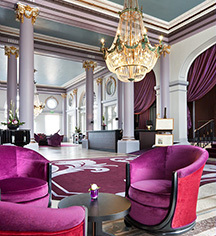 Le Grand Hôtel Cabourg - MGallery by Sofitel, a member of Historic Hotels Worldwide since 2018, dates back to 1907. The Grand Hôtel frequently hosted the celebrated French author Marcel Proust between the years of 1907 and 1914. He regularly resided in one room on the fourth floor, Room 414, in which he wrote some of his finest literature. Age Requirements: No minimum age requirement except for the spa. Deposit: Varies based on conditions. Extra Person Fees: It depends on the prices conditions and the occupancy rate. Hotel/Resort Fees & Taxes: There is a €2.50 tourist fee per night. Parking: Private and closed parking with a valet service is available for €22. Pet Policy: Pets are allowed with a €20 fee. Straddling the majestic Norman coastline is Le Grand Hôtel Cabourg - MGallery by Sofitel, a luxury hotel that has been entertaining guests for more than a century. First built during the 1860s, ambitious hoteliers reconstructed the Grand Hôtel in 1907 to serve the town’s flourishing tourist population. Learn more about the History of Le Grand Hôtel Cabourg - MGallery by Sofitel .